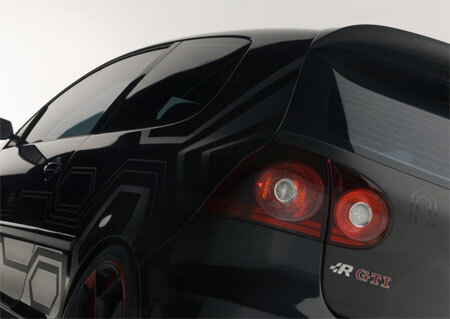 Obviously following the design cues of the recently shown Volkswagen Iroc Concept, the folks over at Volkswagen Design Center California led by Volkswagen Chief Designer Derek Jenkins created this special Volkswagen R GTI for the SEMA 2006 motor show. 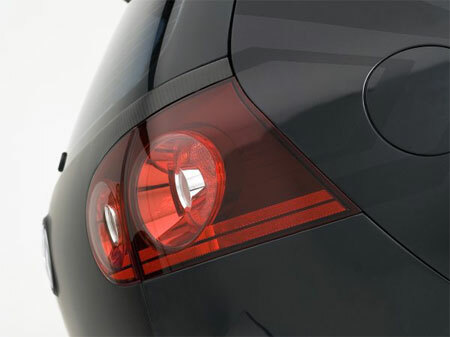 Are we looking at what could be Volkswagen’s new corporate grille? 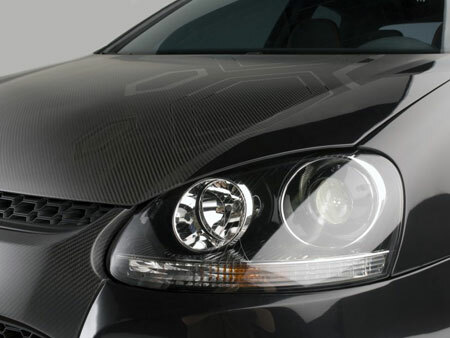 A few body panels have been replaced with carbon fibre, and the suspension system has been updated by H&R Tuning to a H&R RSS Club Sport system, which consists of updated shocks and springs and a pair of adjustable sway bars – this results in crisper handling and a lower stance. 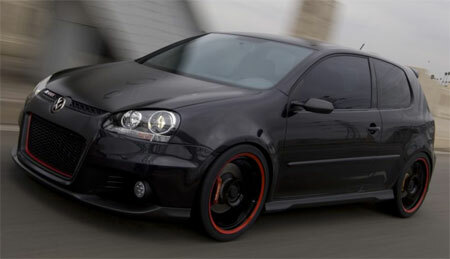 For the engine, aftermarket Volkswagen tuner APR was called in for the job. The stock turbo was thrown out for a larger Garrett unit, and boost upped to 1.45 bar with the help of upgraded injectors and fuel pumps designed by APR, as the stock FSI system cannot handle the higher fueling requirements of the additional power. With the larger turbo, a matching intercooler was fitted, and the exhaust system consists of an Iconel manifold and an APR stainless steel exhaust system. 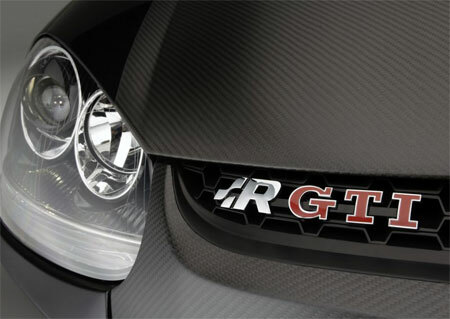 On RON93 gas, the car makes 375hp, but if fed with higher octane RON100 fuel, you get 400 horses. All these numbers translate to a 0-100km/h time of 4.8 seconds. To rein in all that additional power, the brakes have been upgraded to 4-piston Brembo brakes and Brembo two-piece floating cross-drilled discs with billet aluminum hats. Inside the rear wheels are disc brakes fitted with drilled rotors, not as much bite as the front but the whole system works together very well. Wheels are 19 inch wheels wrapped with Michelin Pilot Sport Cup ultra-high-performance radials in 265/30/R19 size. The car is still a front wheel drive, but the clutch was upgraded to one that can handle all the extra torque (460 newton meters! ), as well as a Quaife limited slip differential to stop the wheels from going bald trying to move from a stand still.